When and by whom the changes were made. When specific commits were merged into a branch. Viewing the history of commits for a branch might also help you understand the difference between branches. If you use tagging, you can also quickly view the commit that was labeled with a tag and the parents of that tagged commit. 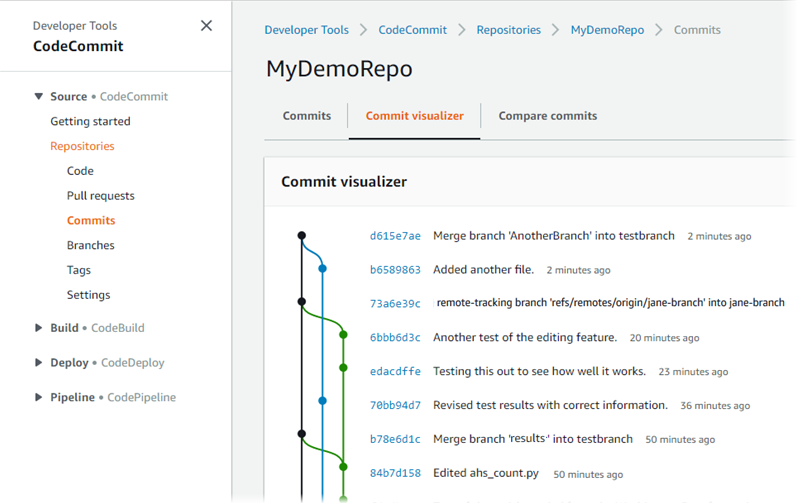 At the command line, you can use Git to view details about the commits in a local repo or a CodeCommit repository. You can use the AWS CodeCommit console to browse the history of commits to a repository. You can also view a graph of the commits in the repository and its branches over time. This can help you understand the history of the repository, including when changes were made. Using the git rebase command to rebase a repository changes the history of a repository, which might cause commits to appear out of order. For more information, see Git Branching-Rebasing or your Git documentation. You can browse the commit history for a specific branch or tag of the repository, including information about the committer and the commit message. You can also view the code for a commit. 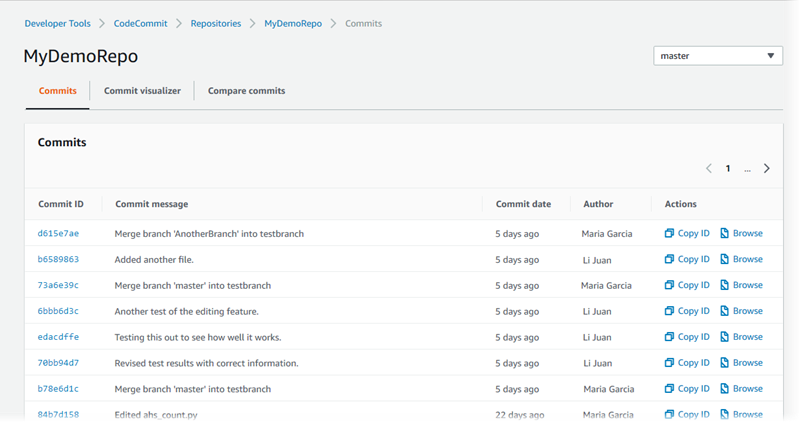 In Repositories, choose the repository for which you want to review the commit history. In the navigation pane, choose Commits. In the commit history view, a history of commits for the repository in the default branch is displayed, in reverse chronological order of the commit date. Date and time are in coordinated universal time (UTC). You can view the commit history of a different branch by choosing the view selector button and then choosing a branch from the list. If you are using tags in your repository, you can view a commit with a specific tag and its parents by choosing that tag in the view selector button. To view the difference between a commit and its parent, and to see any comments on the changes, choose the abbreviated commit ID. For more information, see Compare a Commit to Its Parent and Comment on a Commit. To view the difference between a commit and any other commit specifier, including a branch, tag, or commit ID, see Compare Any Two Commit Specifiers. To view the date and time a change was made, hover over the commit date. To view the full commit ID, copy and then paste it into a text editor or other location. To copy it, choose Copy ID. To view the code as it was at the time of a commit, choose Browse. The contents of the repository as they were at the time of that commit is displayed in the Code view. The view selector button displays the abbreviated commit ID instead of a branch or tag. You can view a graph of the commits made to a repository. The Commit Visualizer view is a directed acyclic graph (DAG) representation of all the commits made to a branch of the repository. This graphical representation can help you understand when commits and associated features were added or merged. It can also help you pinpoint when a change was made in relation to other changes. Commits that are merged using the fast-forward method do not appear as separate lines in the graph of commits. In Repositories, choose the repository for which you want to view a commit graph. In the navigation pane, choose Commits, and then choose the Commit visualizer tab. In the commit graph, the abbreviated commit ID and the subject for each commit message appears next to that point in the graph. By using the view selector button to show the graph for a specific branch. By pasting a full commit ID into the search box to render the graph from that commit. To render a new graph from a commit, choose the point in the graph that corresponds to that commit. The view selector button changes to the abbreviated commit ID. To view information about a commit, run aws codecommit get-commit. To view information about changes for a commit specifier (branch, tag, HEAD, or other fully qualified references, such as commit IDs), run aws codecommit get-differences. To view the base64-encoded content of a Git blob object in a repository, run aws codecommit get-blob. Information about the author of the commit (as configured in Git), including the date in timestamp format and the coordinated universal time (UTC) offset. Information about the committer (as configured in Git) including the date in timestamp format and the UTC offset. The ID of the Git tree where the commit exists. The commit ID of the parent commit. "message": "Fix incorrect variable name"
The commit specifiers you want to get information about. Only --after-commit-specifier is required. If you do not specify --before-commit-specifier, all files current as of the --after-commit-specifier are shown. A list of differences, including the change type (A for added, D for deleted, or M for modified). The mode of the file change type. The ID of the Git blob object that contains the change. The ID of the Git blob (with the --blob-id option). The base64-encoded content of the blob, usually a file. Before you follow these steps, you should have already connected the local repo to the CodeCommit repository and committed changes. For instructions, see Connect to a Repository. To show the changes for the most recent commit to a repository, run the git show command. +A bumblebee, also written bumble bee, is a member of the bee genus Bombus, in the family Apidae. In this and the following examples, commit IDs have been abbreviated. The full commit IDs are not shown. +The horse (Equus ferus caballus) is one of two extant subspecies of Equus ferus. To see the differences between two commits, run the git diff command and include the two commit IDs. +Bees are flying insects closely related to wasps and ants, and are known for their role in pollination and for producing honey and beeswax.